You should encourage students to write clearly and to present their work as neatly as possible; but remember to make your own written comments clearly legible as well. To produce written comments which are not clear or easy to read is a form of laziness and bad manners – or a form of arrogance, which may well be the same thing. It is particularly important that you make your writing as clear as possible when teaching foreign students. Their own national conventions of handwriting and written presentation may not be the same as those common in Britain. Make your written comments stand out clearly on the essay script, but avoid using red ink as a means of creating that effect: many students quite reasonably associate this with an authoritarian manner of teaching and an uncomfortable reminder of their schooldays. Comments written with a soft pencil are usually sufficiently legible, and they have the distinct advantage that they can be easily altered if you change your mind about what you have written. Students will generally welcome a detailed response to what they have written. If they have gone to the trouble of producing 1500 words of close argument they will rightly feel that they are entitled to more than just a few approving ticks in the margin and a percentage grade on the final page. But it is also possible for tutors to put too much comment on an essay. Striking the right balance is a matter of considerable experience, sensitivity, and fine judgement. As a first step towards making this judgement you should try to keep in mind the level of the student’s ability whilst marking a script. Someone making a start on a beginner’s level course will need far more delicate and sensitive treatment than might someone on a third year undergraduate course who is presumably more experienced and accustomed to being challenged. However, you should also keep in mind that even experienced students may be wounded or offended by incautious remarks. Try to pitch your comments at a level which is appropriate to the student’s ability. There is no point in offering advice on sophisticated points of grammar or complex issues in the subject of study to a student who is at beginner’s level. You should also keep in mind the fact that such a student may feel overloaded and intimidated by a script on which every single mistake has been corrected. Do not feel obliged to correct every single mistake or weakness in a piece of work. It might simply have the effect of demoralising the student. This process can be likened to the teaching of a foreign language. To correct every speech error the student makes will simply be inhibiting and deter even the most confident from attempting to speak at all. It is often the case that students at beginner’s level need assistance with their writing skills. You might therefore give more attention to this aspect of what they produce rather than concentrating upon the substantive subject matter they are discussing – though they will probably want some response on this, so as not to feel that the essay is just an empty exercise. Remember that students cannot eradicate what might be the bad habits of a lifetime with just one set of your guidance notes. You need to be patient when necessary, and be prepared to accept gradual improvement. Even though surprising leaps forward in ability do sometimes occur, progress is more likely to be gradual and incremental. One way of creating this friendly tone and generating the sense of dialogue which your written comments are designed to create is to use the student’s first name. A note which begins ‘I enjoyed reading this particular piece of work Mary …’ or ‘You have obviously put a lot of work into this essay John …’ will help to establish this notion of friendliness and rapport. Even if you are going on to point out a number of weaknesses, this warmth of tone establishes the note of consideration and sympathy in whose spirit they will be made. If you are keeping a record of student grades you can use this as a point from which to establish your comments on their progress. By referring to earlier essays and drawing attention to any positive developments, you will be giving students a reassuring sense that you are treating them as individuals, and this type of comment itself is a useful teaching strategy. In cases where there has been a sharp drop in the level of achievement or maybe an obvious misunderstanding of what was required, you can offer the reassurance that this does sometimes happen to even the most able students. The important thing is that the student should learn from the experience by understanding what went wrong and appreciating if possible why or where the misunderstanding has occurred. In general you should try to avoid raising questions – since the student cannot answer them directly. A marginal note such as ‘Your meaning is not clear at this point’ is much better than ‘What does this mean?’ For the same reason you should also try to avoid putting question marks in the margin. Students may not be able to locate the cause of your query, they have no way of knowing what you mean, and they therefore have no way of checking whether or not they have the right answer. It cannot be stressed too frequently that you should avoid any form of loftiness, superiority, or irony in the tone of your written comments. Even when students reveal themselves to be bigots or they put forward arguments which are foolish or improper, you should remember that you are in a tutor-student relationship which gives you authority and power. This power should not be abused. 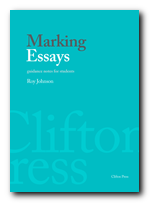 Where there are clear signs that a student is persistently using the essay as a vehicle for showing off, being deliberately provocative, or making remarks of an inappropriate nature, you should resist the temptation to be drawn into making a response which is argumentative or reproachful. This is usually what the student is trying to elicit (see Section 9.3 and 9.7 on Attention Seeking). You will probably have a more useful pedagogic effect and protect yourself against time-wasting by remaining politely assertive and requesting that the student follows the essay writing conventions required by the subject discipline. Remember that no matter what their actual level of achievement, many students put a great deal of effort into producing what they write and may often labour for many hours to produce even a very modest piece of work. This is another reason for avoiding any marks of impatience or casualness in the tone of your remarks. Remember that your comments should usually be a balanced mixture of detailed and general points. In most cases this will occur as a matter of course if you respond to the script in a normal manner, but it is worth keeping in mind as a model of good script marking for those instances where there is a significant difference between the written style and the subject content of the essay. Students who have difficulties with their writing skills for instance will normally need more advice on points of detail. However, you should not merely spatter their scripts with corrections of faulty grammar, punctuation, and spelling: they should be encouraged to develop their arguments or generate more ideas as well. Similarly, you will naturally have more to say in response to the ideas of those students whose writing skills are well developed; but even they may be given encouragement and tips on the finer pints of presentation and elegance of expression.